Sentient Alien Armour...Nanotech Saturation...Magical Energies...No matter the powers, no matter the choices, the price in body and mind may be more than you're willing to pay. And your choices will lead to heroics...or to villainy. How will you be remembered? The edge between superhero and villain has never been sharper. In the Valiant Universe RPG, players will immerse themselves in a dark and gritty world where every mission and every battle has deadly consequences. Whether playing X-O Manowar, Bloodshot, Shadowman or event the all-powerful Toyo Harada - or any of dozens of characters - Valiant's most fearless heroes will unite for the first time in a roleplaying game, allowing you to join their stories and create new ones! 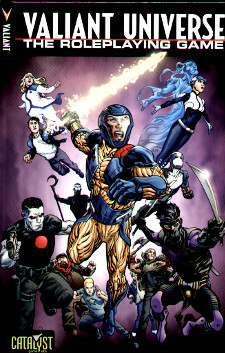 Whether you're a longtime fan, or brand new to the Valiant Universe, this is the only source you'll need to bring Valiant's leading characters to life in a fantastic superheroes setting! Cue System: The rules-light and easy to learn Cue System allows a novice or uninitiated RPG player to quickly get inside the head of their superhero and plunge into action.